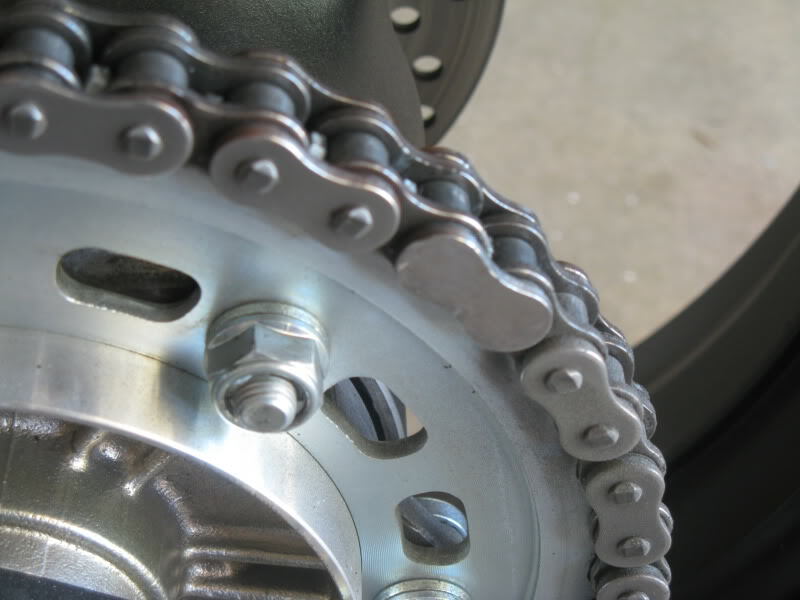 So this is my first chain & sprocket change ever and I thought to take some pictures and illustrate how it went along. It would have been nice to have read more tutorials prior to doing this, but I’ve only seen a couple, including one by our very own Rider003. I tried to include some things perhaps left out by the others. My bike had reached 14K miles and the chain was nearing its end. It had a nasty tight spot in it and as you can see below, it was in the red zone (stretched out). 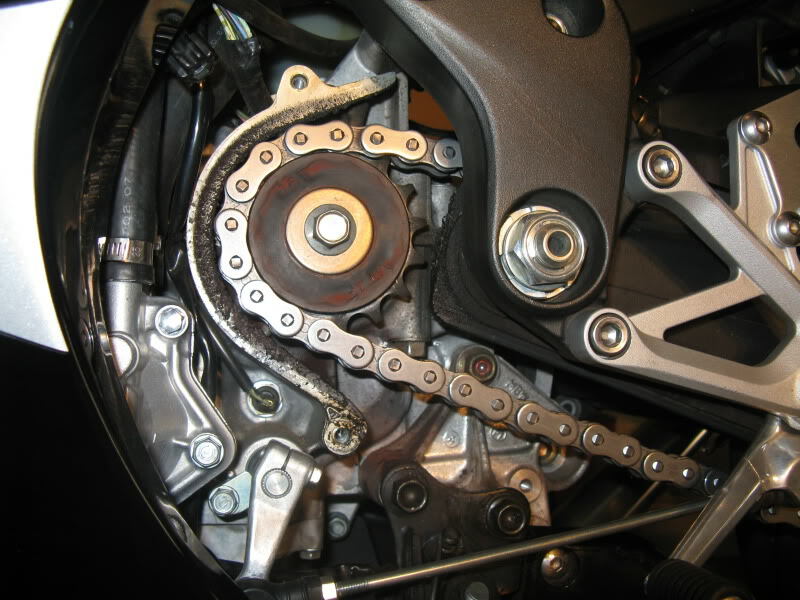 We begin by removing the chain guard and taking the counter sprocket cover off. There are two 5mm Allen head (hex) screws on the guard and two 8mm bolts for the cover. If you find yourself having a hard time doing this, then perhaps you ought to seriously consider having a qualified mechanic do it for you, lol. 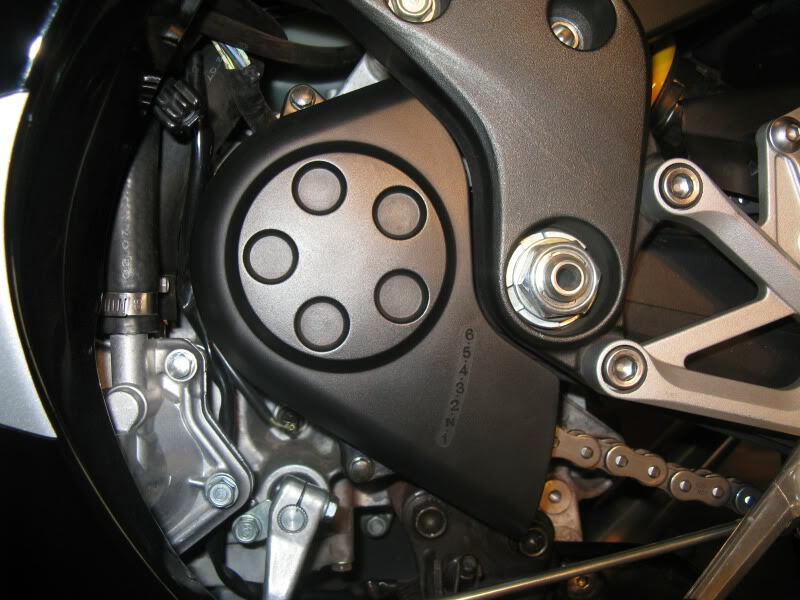 With the counter sprocket cover off, you can now loosen (not remove) the single 14mm bolt that holds it on. 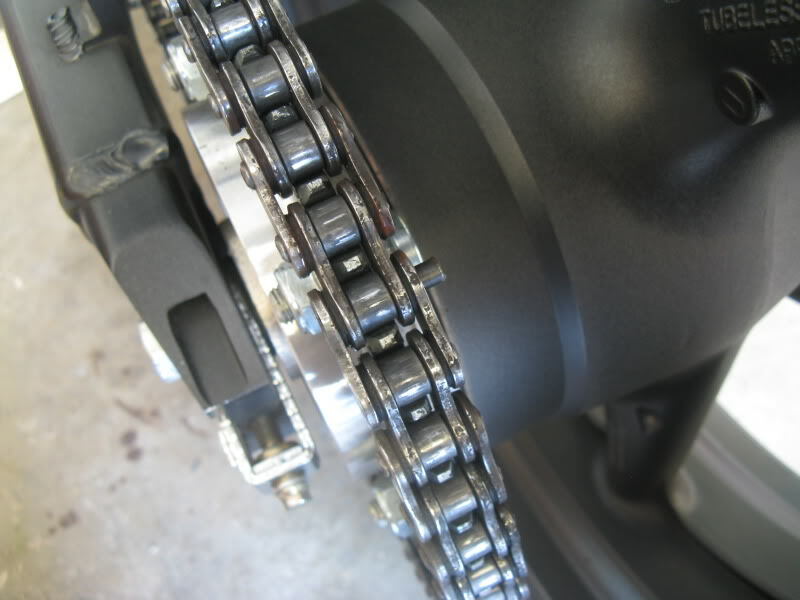 Put the bike in neutral so as to not put any strain on the transmission but rather on the chain. 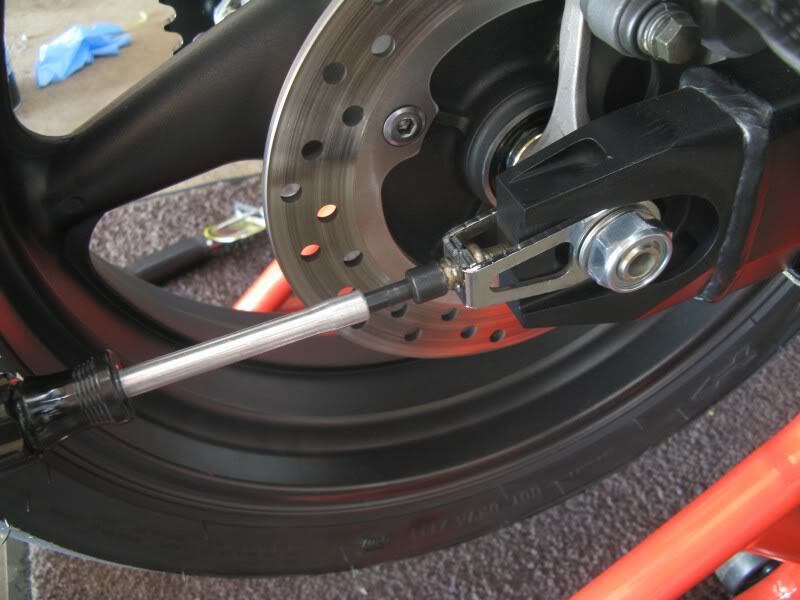 Sit on the bike, apply the rear brake, and loosen the bolt; or you can have someone else apply the rear brake for you. That was followed by loosening (not removing) the six 17mm rear sprocket nuts. Easier to do while the wheel is on the bike, imo. Get yourself some sort of grinding/cutting tool to file down the rivet on the chain. 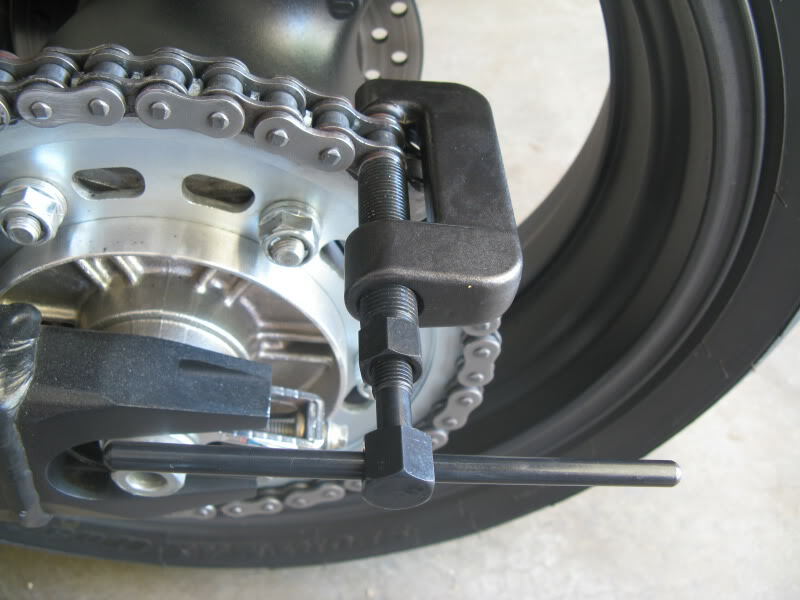 This is done in order to facilitate the removal of the pin with the chain tool. 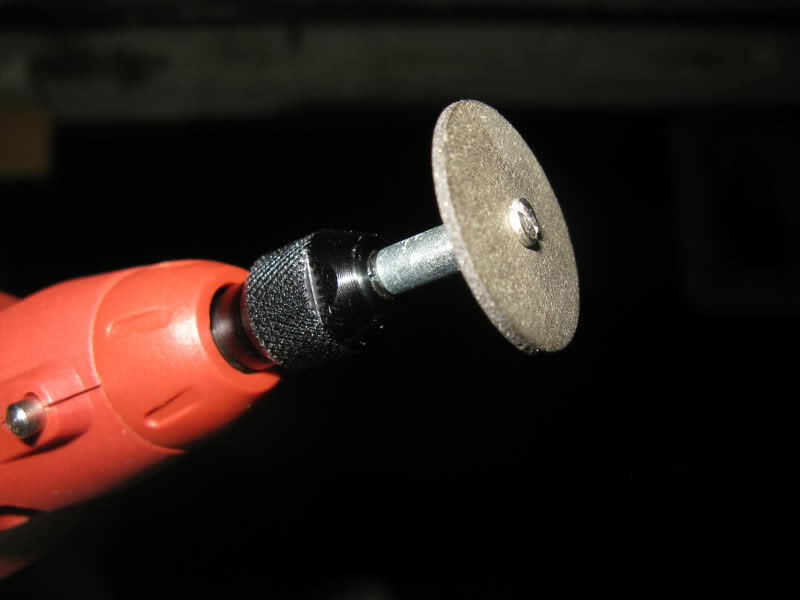 It is easier to grind off the rivet, than to try and force it through; make sense? 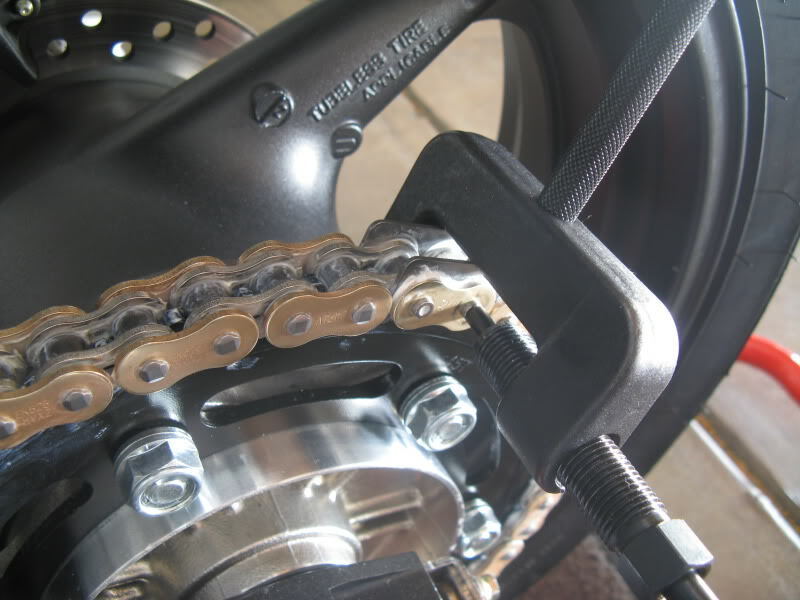 Remove the chain and front sprocket but be careful not to lose the bolt & washer, you’ll be needing those (that goes for all fasteners mentioned). 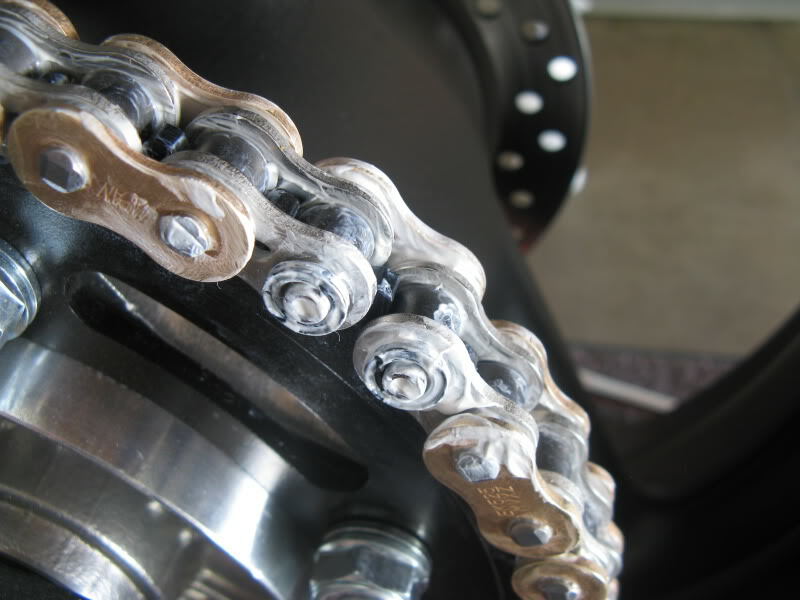 Clean all the nasty stuff off before you put your nice new chain & sprocket on there. 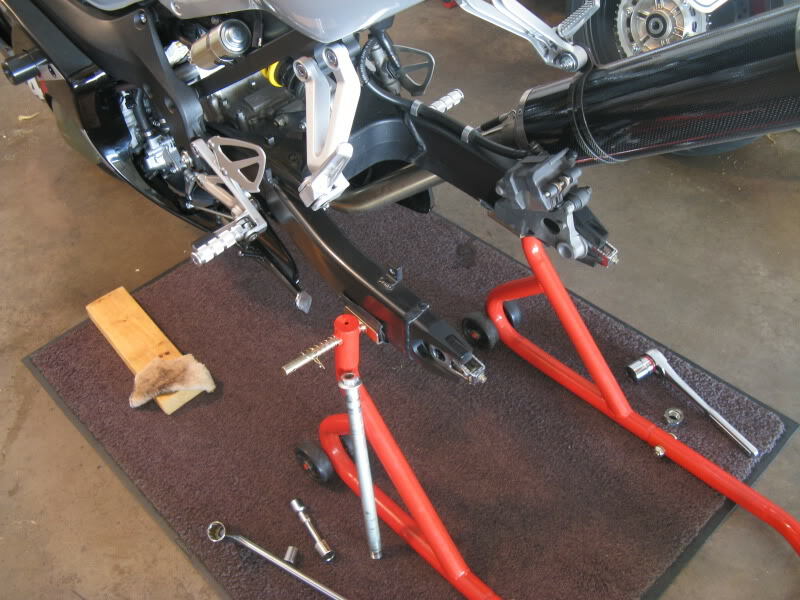 While you’re there, take care of the side stand with a good cleaning & lube. 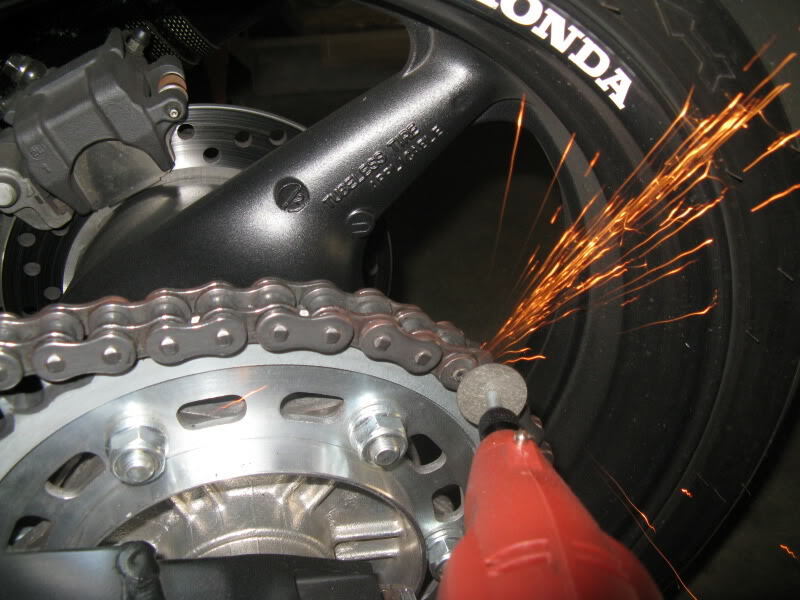 Now proceeding over to the rear wheel; in order to remove the sprocket, you’ll have to take the wheel off. The axle bolt is 22mm and the axle nut is 27mm. While you’re in there, again, it’s a good time to clean and inspect. 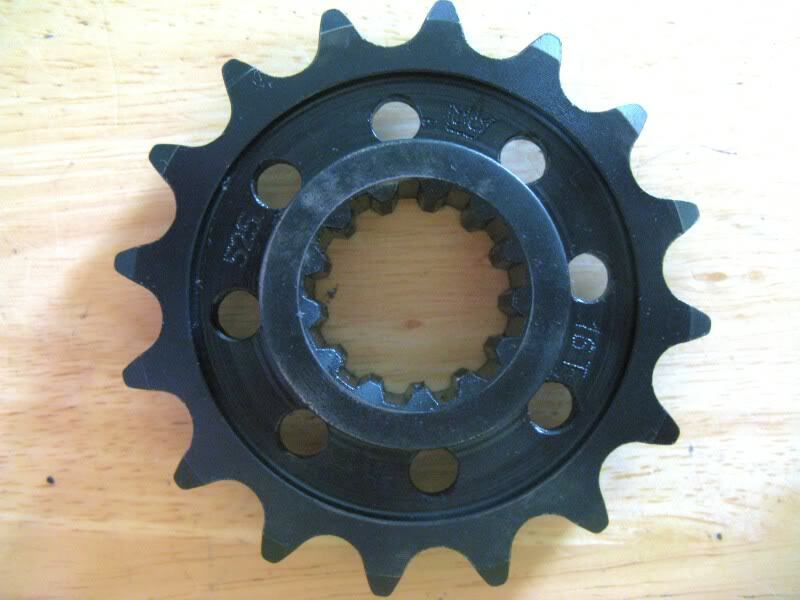 Here’s the rear OEM sprocket which is bolted to the “cush drive” hub. The cush drive hub comes off the wheel rather easily (just pull on it) and there’s six rubber bumpers on the other side so if you don’t feel like messing with them, handle the wheel nicely lest it falls off. Also there are two spacers on either side (the shinny metal rings in the middle). Those come off also (easily), so don’t loose them or get them mixed up. 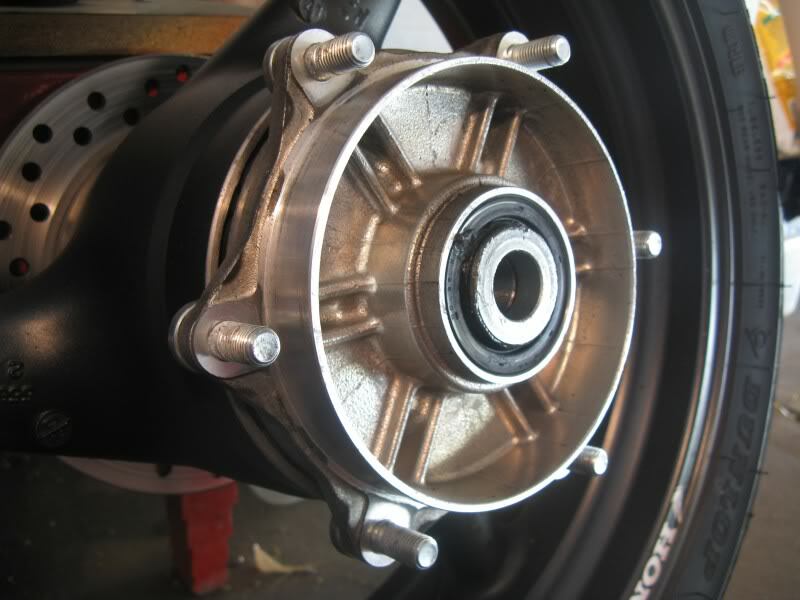 Care must be taken with the brake disk (rotor) in that you don't damage it while handling the wheel. Do not lay it flat on a rough/hard surface. If you haven’t inspected the rear bearings and seals in a while, right now is a good time to clean & lube. 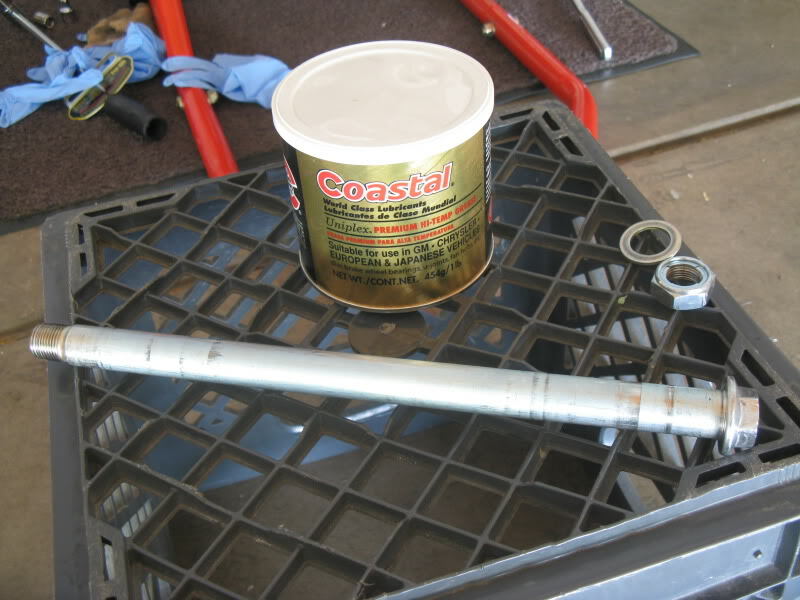 When reinstalling the axle, make sure you wipe it down, and re-apply grease; just a medium film will do. 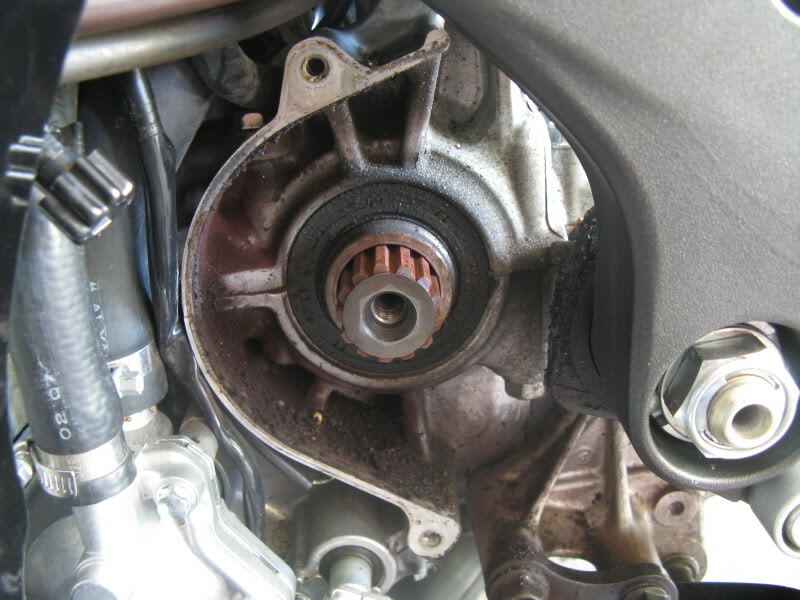 Also, make sure to degrease the axle bolt & nut threads after intalling the wheel. 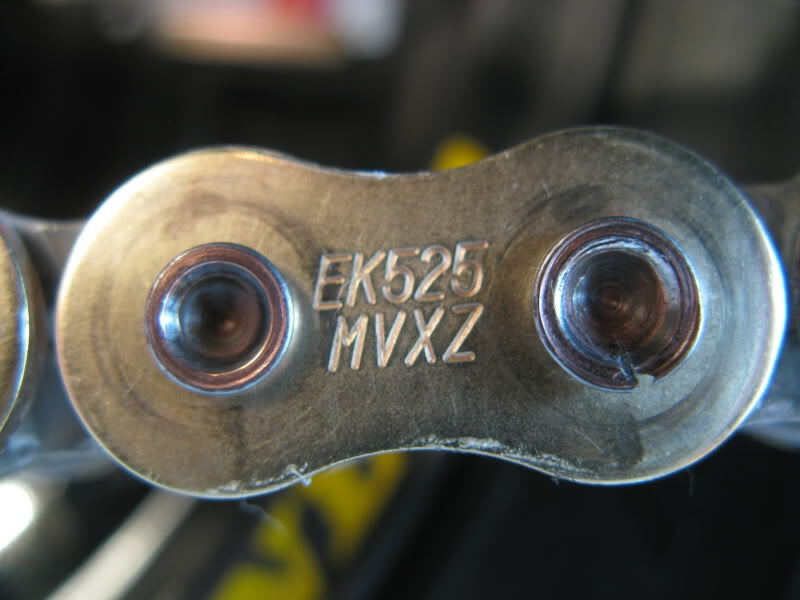 Failure to do so may result in the bolt becoming loose over time. See the nitrile gloves in the background? 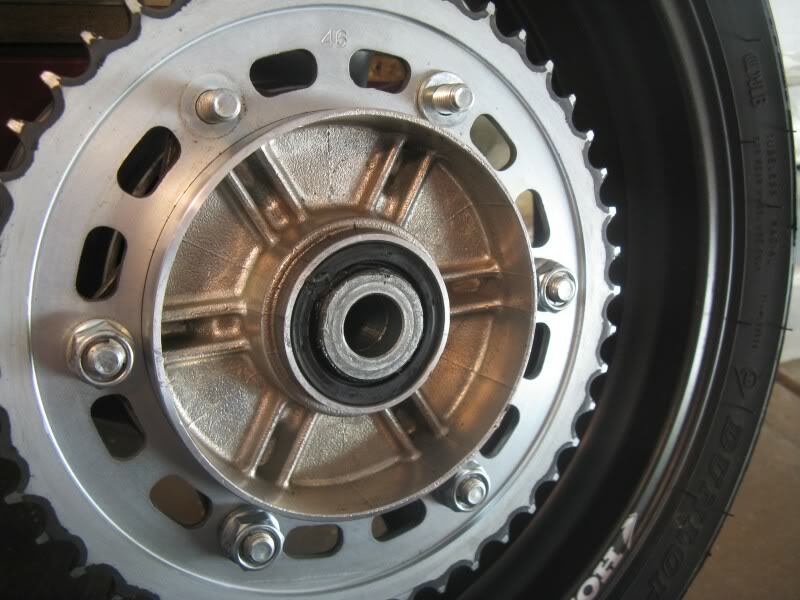 Attach the sprocket onto the wheel, and put the wheel back on. Attach the new counter sprocket on. I did not torque the rear sprocket nuts down just yet nor with the counter sprocket; I’ll wait until the chain is back on, just like with removal. Tighten the two 8mm chain adjuster bolts all the way in and pull the new chain on. 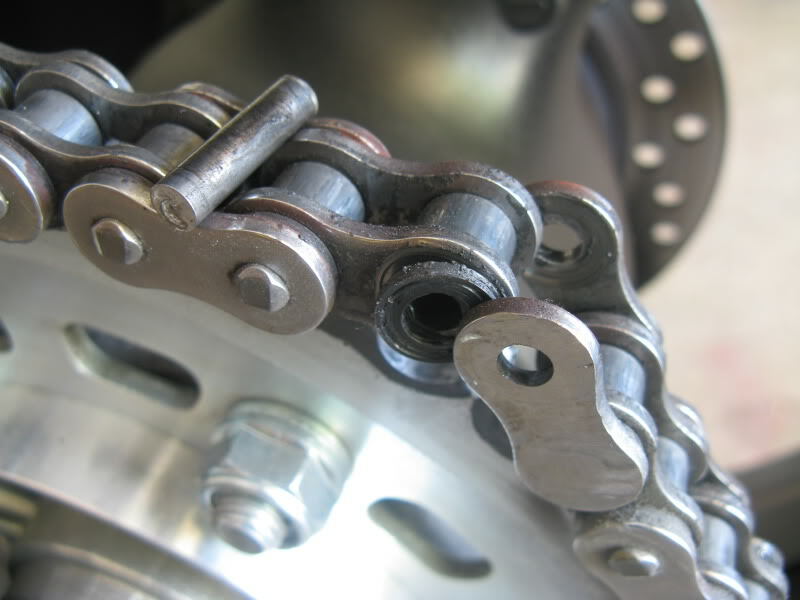 Measure the chain and cut the excess links off (when applicable), same procedure as removal of old chain. 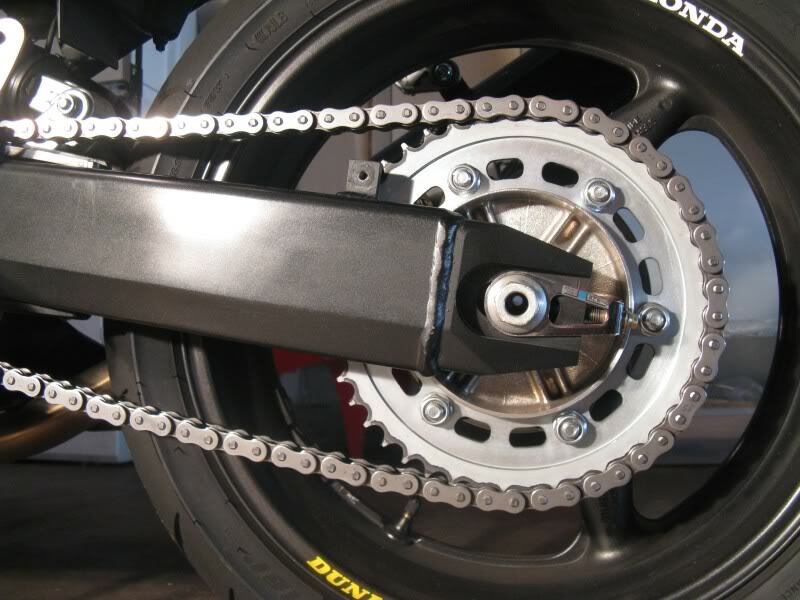 A stock geared F4i takes a 108 link chain. 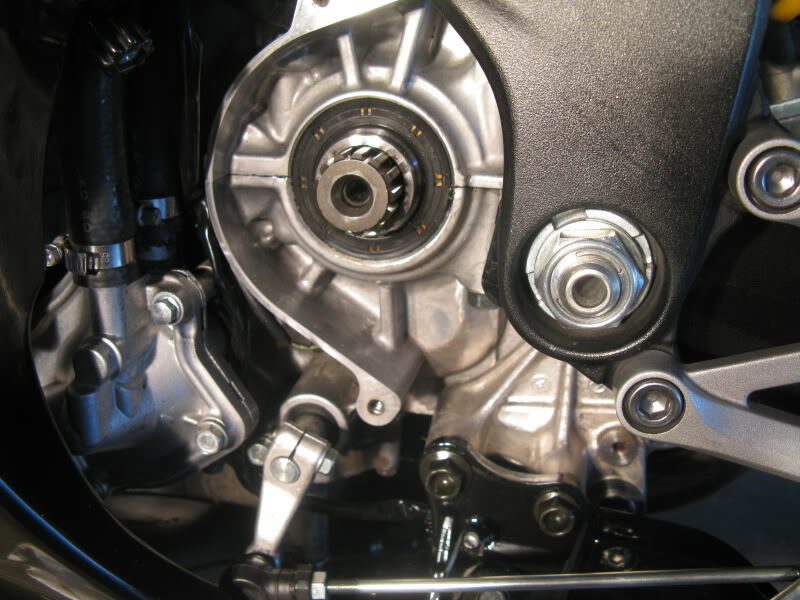 Place your master link in making sure to lube it and the o-rings well with the supplied lubricant. Put in your spacers. This prevents you from squishing the o-rings too much and possibly ruining them. The side plate will now have to be pressed on; it’s a very tight fit. You’ll basically going press it on until it won’t go in anymore. It's going to require the use of the chain tool with the two press attachments (the square ones). Once the side plate is on, the pins need to be riveted, which is basically mushrooming the ends so that the side plate doesn’t come off. 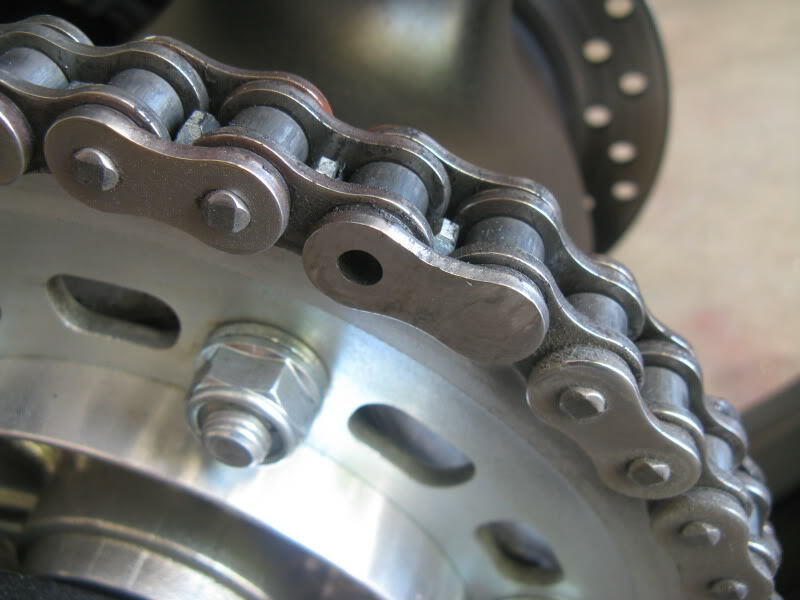 The majority of stress placed on a chain is longitudinal, thus side plates require only sufficient riveting of the pins to prevent them from slipping off. When riveting the pins, we’re only talking hundredths of an inch here; not much. So don't over do it. Oops! This being my first attempt, I messed up the master link by tightening a pin too much (of course), which is good, because you get to see what not to do. The one on the left side is perfect; the one the right is not; see the crack in it? So off went the damaged master link and it was replaced with a new one ($5). If you crack yours, do the same, toss it & get a new one. Now I’m not endorsing any brand, manufacturer, and/or retailer. 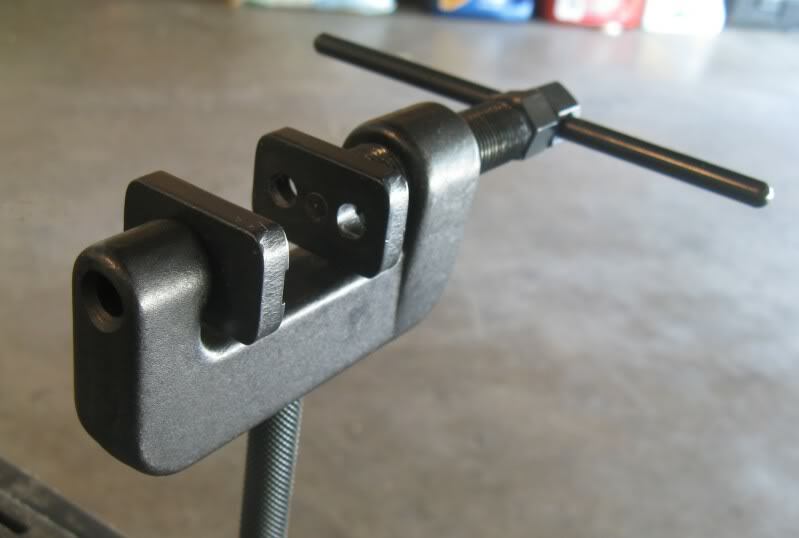 The riveting/breaker/press tool used here is the Pit Posse ($40 e-Bay). You can get the same one with “Motion Pro” stamped on the side for $80 if you wish. There are better out there, but this one is good enough. If you can afford it, get the $100+ tool. One word of advice is to lubricate the tool with heavy duty grease (axle grease). 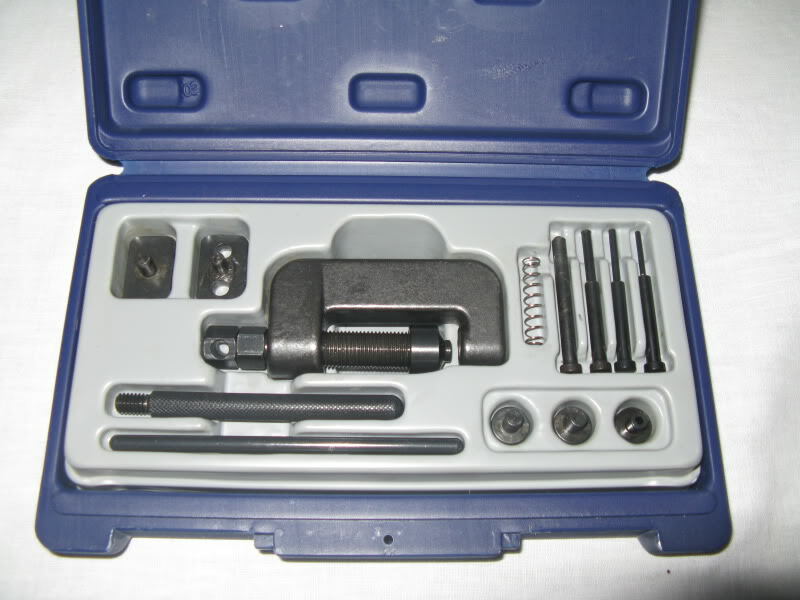 It makes the rivets come out more uniform and it reduces friction on the tool threads (heat & fatigue). Very cool! I will be needing this much easier than I thought it would be. Btw what stand is that? I need to get one. Pictures are worth a thousand words! Nice write up. Only thing I have to make sure I pick up is a torque wrench, other than that everything else is g2g! Nice PIC sequence, good write up, well done job. 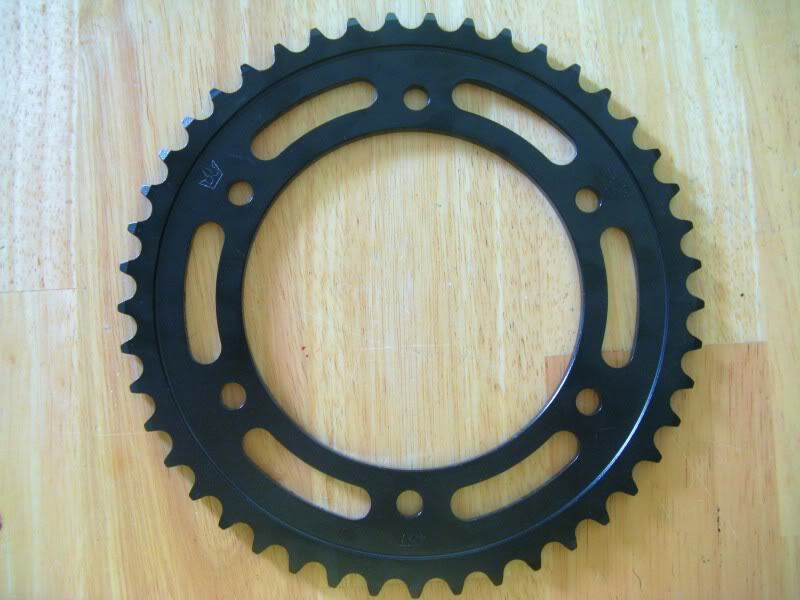 how much did the entire cost swap, including both sprockets and the chain and where did ya buy em? 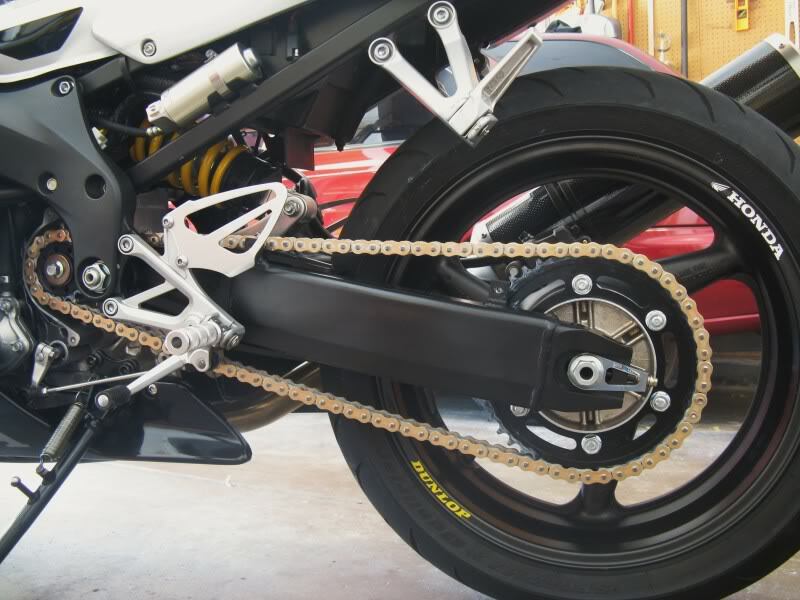 im in dire need of a new chain and sprocket...haha like whoa. 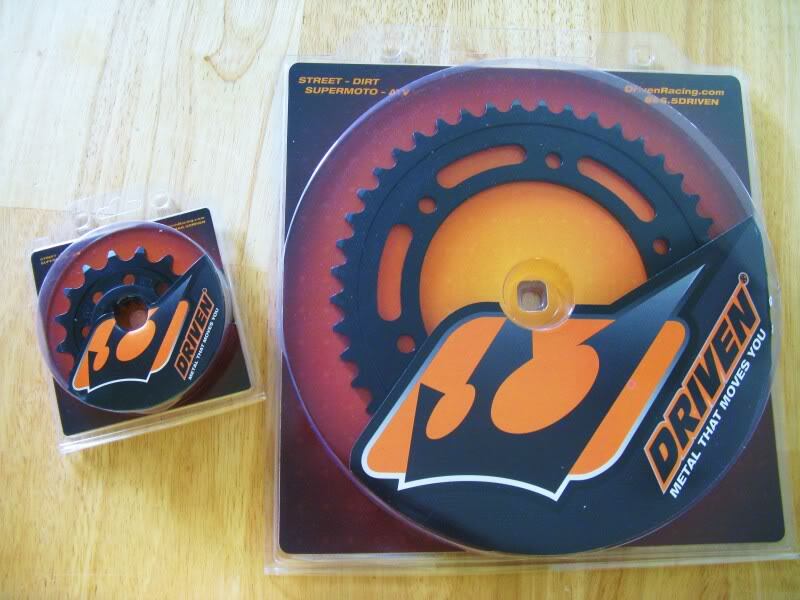 Bought the sprockets through Driven Racing. The chain and riveter tool I got through e-Bay. I'm not going to post how much I paid because there's always a smartass that suggest I paid too much.